You can use this Ontario child support calculator to determine the base amount of child support payments that may need to be paid. The child support calculator, Ontario can prove useful if you are a parent at the commencement of a family court action within the province of Ontario. 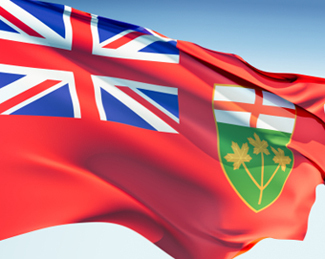 Ontario’s family court system is guided in part by two different pieces of passed legislation. Those laws are Ontario’s Divorce Act and the Family Law Act. The courts will write and pass orders based on the situation which you would fall under. The foregoing calculations are for sole custody situations (i.e. where the children live with one parent more than 60% of the time). Use this calculator for shared custody situations. If you require clarification and understanding as to which of these laws apply to you, you are strongly encouraged to seek legal advice or speak to Courts Administration workers at your local Ontario Court of Justice or Superior Court of Ontario offices. Many parents who are in mutual agreement of what is to be paid for child support might easily get an agreement ordered by the court, even if the amounts are not in-line with the child support guidelines. If one of the parents applies for a variation after an agreement is ordered, the courts could then use the child support guidelines as a means of calculating the amounts to be paid. This is where the Ontario child support calculator could again come in handy. If there is some undue financial hardship the amount of support paid could be different than what is set in the guidelines. The Ontario child support calculator is here for informative purposes only. It is not meant to replace the advice and direction of qualified legal counsel. You are encouraged to seek the assistance of a lawyer in your area should you require more help. If you think you cannot afford a lawyer, contact your local Legal Aid of Ontario office. 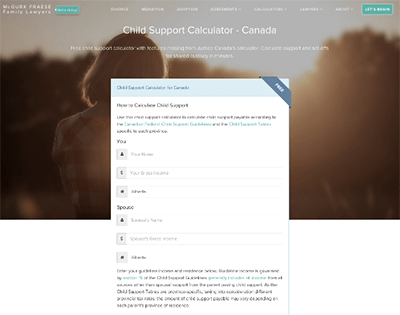 A Canada-wide child support calculator suitable for shared or split custody situations. Can also calculate spousal support. 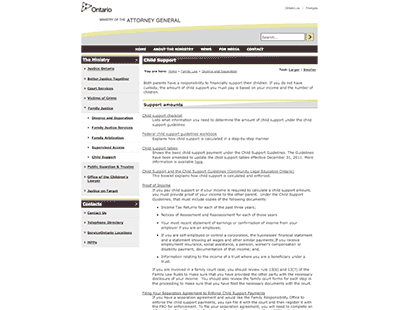 The Attorney General of Ontario runs a website on family law issues including child support. 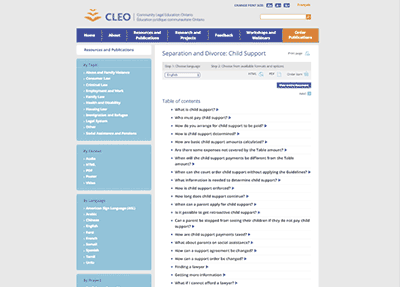 Continuing Legal Education Ontario (CLEO) has a very helpful FAQ on child support in Ontario.